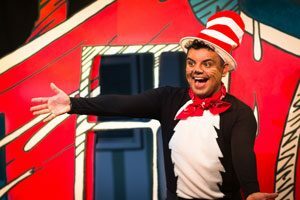 Expect a brother, a sister, a much put-upon goldfish, some Things, and tons of clowning around in this new production of Seuss’s classic rainy-day tale that brings the Cat in the Hat’s outrageous antics–and Dr. Seuss’s wondrous rhymes–to life in Spanish and English. 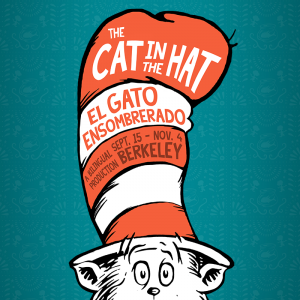 How much of The Cat in the Hat / El Gato Ensombrerado is in Spanish? The show is a good mix of Spanish and English, but anyone who has read the book or knows the story will be able to follow along because the production is highly physical and follows the plot of the book. What age range is recommended for this show? Children ages 3 to 10 are recommended to see this show. Espere un hermano, una hermana, un pez, algunas Cosas, y muchas payasadas en esta nueva producción teatral de la historia clásica sobre un día lluvioso que combina las extravagancias del Gato Ensombrerado — y las rimadas maravillosas de Dr. Seuss–en español y en inglés.